Date-Jitoku, a fine waka poet, wanted to master Zen. With this in mind he made an appointment to see Ekkei, Abbot of Shokokuji in Kyoto. Jitoku went to the master full of hopes, but as soon as he entered the room he received a whack. He was astonished and mortified: no one had ever dared to strike him before, but as it is a strict Zen rule never to say or do anything unless asked by the master, he withdrew silently. He went at once to Dokuon, who was to succeed Ekkei as abbot and told him that he planned to challenge Ekkei to a duel. "Can't you see that the master was being kind to you?" said Dokuon. 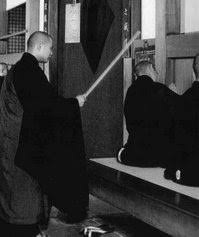 "Exert yourself in Zazen and you will see for yourself what his treatment of you means." For three days and nights Jitoku engaged in desperate contemplation, then, suddenly, he experienced an ecstatic awakening. This satori was approved by Ekkei. Jitoku called on Dokuon and thanked him for his advice, saying: "If it hadn't been for your wisdom I would not have had such a transfiguring experience. And as for the master, his blow was far from hard enough."